***We keep no extra stock, built on order only..
that may cause it to take a little longer. ponds or lakes. The 12ft Water Wheel makes a great focal point. Built using over 800 weather resistant screws!! Bolted together with 64 carriage bolts!! Kits are broken down in 8 sections for easy reassembly. 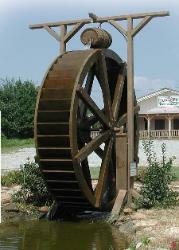 All images, Material & Designs on this site is property of Sullivan's WaterWheels !!!! find out your shipping cost.. This button DOES NOT Reflect Shipping Cost. We will Email you a separate button for Shipping cost Later.